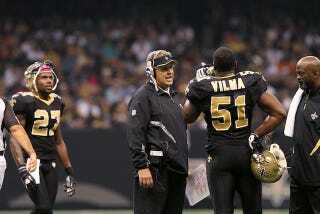 On Saturday night, Jonathan Vilma filed his second lawsuit against the NFL in U.S. District Court in New Orleans. In his latest filing the Saints Linebacker has asked for a quick ruling on his supension appeal and, alternatively, for a temporary restraining order that would permit Vilma to continue working should Goodell uphold the ruling. According to the CBA, argues Vilma, the NFL should have made a ruling "as soon as practicable" and should have been June 25, the first business day after the record was closed. Since the players refused to offer new evidence in protest, the League should have made a decision quickly. Vilma also used the new suit to reiterate some of the claims we have grown accustomed to in this scandal-gate, with a few twists. His suit also claims that the few key pieces of evidence the league shared are flawed, including printed reproductions of handwritten notes. "The NFL's alteration of other documents evidences that the NFL cannot substantiate the suspension, and undermines the integrity of the process," Vilma's lawsuit states. The credibility attacks do not end there. Vilma alleges that fired assistant coach Mike Cerullo, a man responsible for providing information key to the NFL's investigation, had a vendetta against the Saints after being fired and receiving what he claims was an imitation, cubic zirconia, Super Bowl ring. More important than that ridiculous allegation is the one alleging Cerullo created a document listing bounty pledges for the 2009-2010 season NFC Championship game "well after the 2009 NFC Championship game and in an effort to gain revenge against the Saints." The Vilma suit also alleges that Cerullo retracted his statements made to the NFL, an allegation the NFL has denied. Finally, Vilma alleges that a "close friend and associate" of former defensive coordinator Greg Williams, claims Williams never admitted to the existence of a bounty program in discussions with Goodell. This, however, sounds like another in a line of exercises in semantics as Williams did admit to participating in a "pay for performance program." Drew Brees Says The NFL&apos;s Bounty Evidence Is Like Bush&apos;s WMDs. He&apos;s Not Wrong.